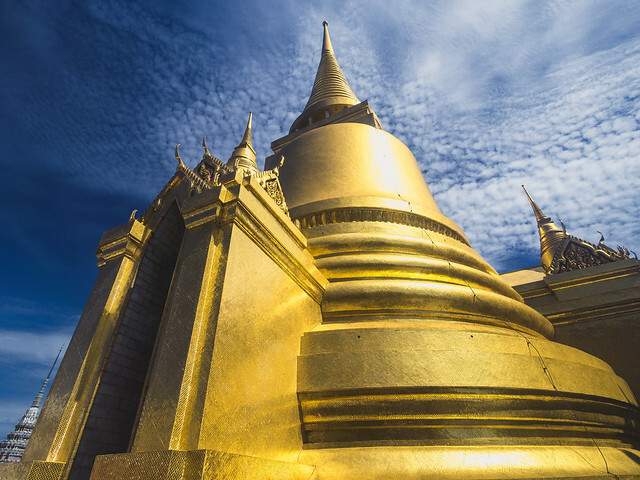 When compared to other parts of Thailand and neighbouring countries, Bangkok can, at first glance, seem a little bit on the pricey side. Whilst there are world class luxury and boutique hotels, gourmet international restaurants with dishes prepared by renowned chefs, expensive attractions, and over priced drinking spots, it is still very easy to explore Bangkok on a budget and not dent the wallet or bank balance too much. Most visitors flock to Bangkok during the cooler season, when the pavements aren’t quite so steamy and the air isn’t quite so muggy. With most places having air conditioning though, a visit in the hotter season can be perfectly comfortable and yield significant savings. Accommodation is almost always cheaper, some attractions may offer discounts, and businesses and services such as tuk tuks, massages, manicures, and the like often drop prices to draw in more people from a smaller field of customers. 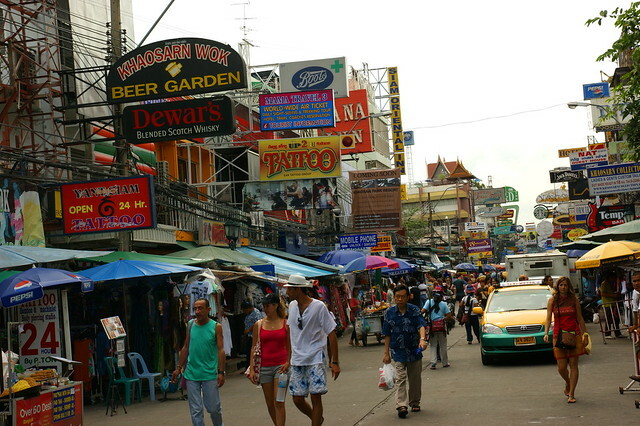 The best deals are almost always found in the famous backpacker area of Khao San Road. Quality can vary immensely though, so make sure to check the room before parting with any cash. Air conditioning costs more than a fan, and cheaper rooms will often be very basic, with no added extras like a TV or refrigerator. To cut costs even more you could stay in a room that contains essentially a bed only and share a cold water bathroom with other guests. Dormitory rooms are also available. Soi Rambuttri is another option near to Khao San Road, offering similar prices and a quieter environment. Sukhimvit Road has some reasonably priced rooms. Hostels and cheap guest houses are available in other areas of the city, but are not so plentiful, and will often already be fully booked if one arrives looking for a walk in room. Silom is a pricier option, as are places near to the airport. Many areas of Bangkok, especially the old part of the city with the Grand Palace, are easy to explore by foot. Don’t waste money on taxis when you can easily get out and hoof it. If you must take a taxi, insist on the meter being used. If the first few drivers won’t agree wait for one who will – it will not take long. Public transport in Bangkok is cheap and efficient. The BTS sky train covers most of the newer areas, and the underground MRT is also a good option in some parts of the city. The commuter ferry is a great way to both get across the river and take in some of the sights whilst doing so. Buses are cheap, but can be slow and difficult to find. 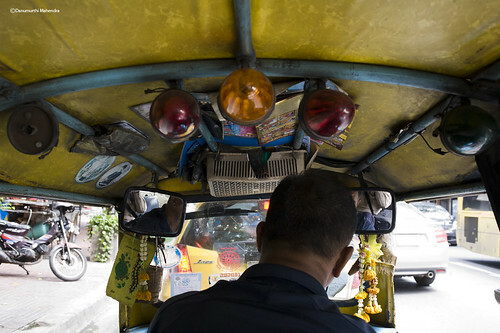 A ride in a tuk-tuk is part of the Bangkok experience, but don’t use them all the time, as they can be expensive when compared to other modes of transport. 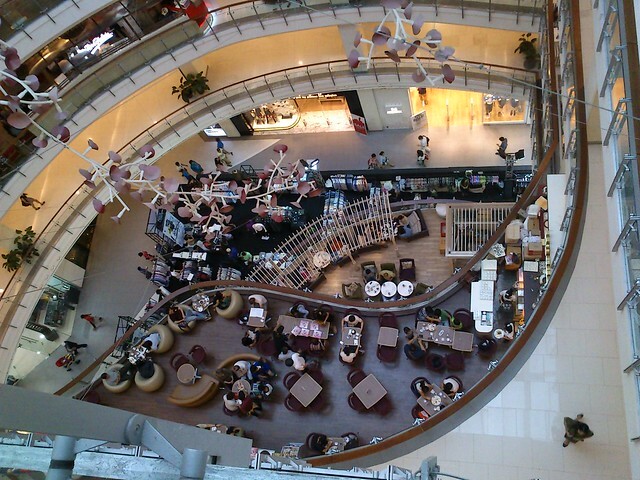 Avoid the lure of places that cater mainly for the tourist crowd. Even Thai dishes will be more expensive in such places. Instead, look for the cheaper eateries alongside the pavements where the locals are eating. Food is likely to be a lot more authentic and tasty, and cheaper to boot! Don’t shy away from street vendors either – Bangkok has some of the best street food in the world, and for excellent value. Markets are also a great place to eat on the cheap in Bangkok. Bar drinks can be quite a bit more expensive than store bought drinks, so a great way is to pre-game in the room before heading out to enjoy the pulsating atmosphere. 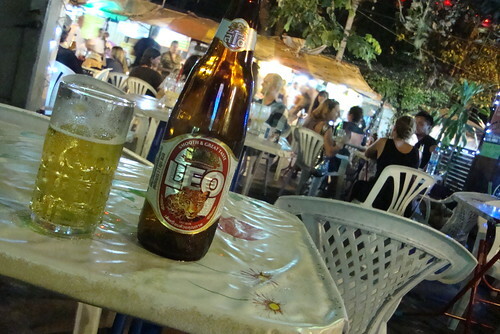 Locally produced drinks, especially Thai whisky and beers, are always cheaper than imported brands. Avoid the shopping malls and pick up your souvenirs in the markets. Bartering is expected. A great market to check out is the expansive Chatuchak weekend market, which sells everything you may want.. and more! Exploring Bangkok on a budget can be done. Plan ahead, avoid the typical tourist traps, and have a fantastic inexpensive time.